Perfect gift for any beer connoisseur. Holds up to 14oz of your favorite beverage. Double walled insulation keeps your cool drinks cool and your warm drinks warm! Tumbler measures 3.5 x 3.5 x 8"
Gold / Yellow colored lid. 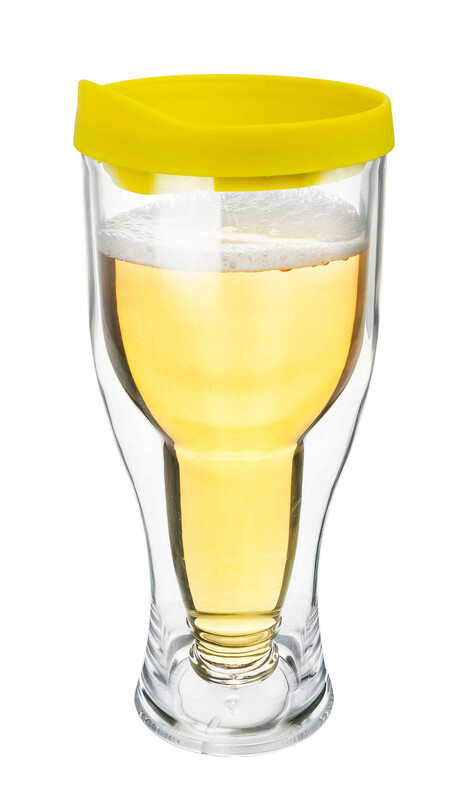 14oz Beer Tumbler W/ Drink Through Lid. Hang out at the pool and be cool with your Beer Tumbler! These acrylic sippy cup tumblers are stronger than glass and they are dishwasher safe! Double wall insulation helps maintain the perfect temperate of your beer, just the way you like it. Perfect for your next party, golf course visit, or just lounging around the house! Tumbler measures 3.5 x 3.5 x 8". Gold / Yellow colored lid.